The Living Room Area has sliding door access to the Ocean view balcony and a comfortable sleeper sofa. Renovations include new paint, flooring, lighting and all furnishings. 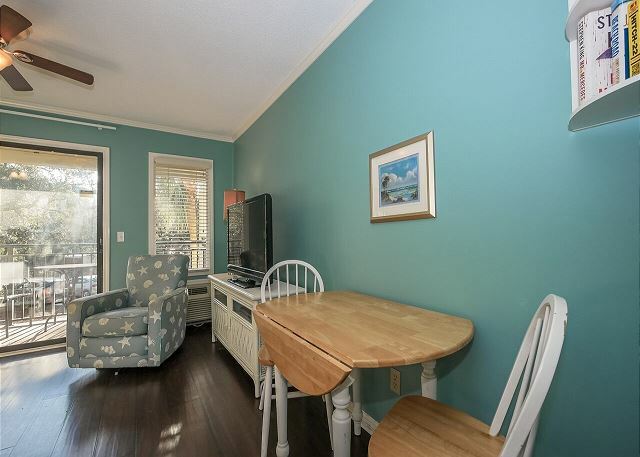 This coastal influenced living and dining area has a new flat screen TV and a table for two. Balcony with a view of the ocean; and a ceiling fan for those warm summer days. Living room has a large flat screen TV for your viewing pleasure. Table for two for breakfast, lunch and dinner. 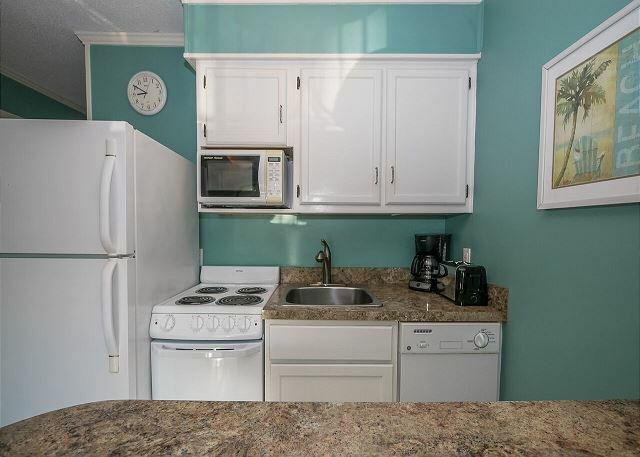 The kitchen has granite countertops and is fully equipped to meet all of your cooking needs. Tile flooring and granite countertops make up this delightful kitchen. Bunk beds in the hallway are perfect for young children or your belongings. Master bedroom has a ceiling fan & a queen size bed. Beautifully decorated bedroom has a queen size bed. The bedroom has plenty of storage space. The balcony is a great place for morning coffee or evening cocktails. Just through the palms, is the Atlantic Ocean. Welcome to Seaside villas; an Ocean front property. The swimming pool is conveniently located at the center of the property. Our new roofing project last year was a huge success. The Seaside pool is a great place for exercise, fun or relaxation. The inviting swimming pool is just one floor away. Enjoy a BBQ picnic while enjoying the grilling area at Seaside II. Our beautiful beach is steps away from Seaside Villas. 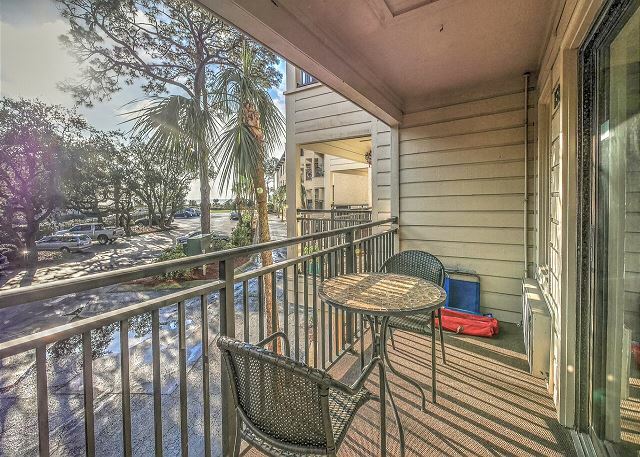 Catch some rays on the sundeck, conveniently located between the beach and Seaside II. The pathway to paradise; where you get your vitamin SEA!! Seaside Villas is steps away from Hilton Head's beautiful beach. Hilton Head's best beach is just steps away from Seaside II. The beaches on Hilton Head are some of the best on the east coast. Come and make lifetime memories at Vacation Time of Hilton Head!! Welcome to Coligny Beach Park. Coligny Beach Park's fountains; Great for cooling off after a day at the beach. The Coligny Beach Park fountain is beautiful at sunset. Coligny Beach Park has public restrooms, rocking chairs and swings! Coligny Beach Park has changing rooms for your convenience. 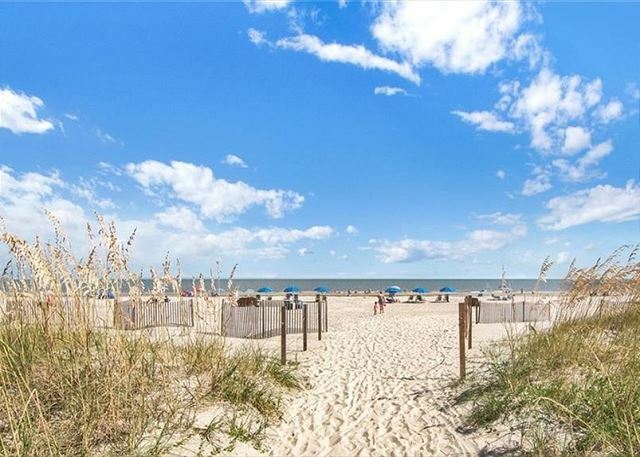 The Coligny Beach Park is just a five minute bike ride and a short walk from Seaside Villas. Coligny Beach Park public beach access. State of the art fitness equipment is available, so you can stay on schedule with your exercise regime while away from home. Enjoy the indoor heated lap pool and jacuzzi. This villa offers a separate bedroom with a queen size bed, fully equipped kitchen, living and dining area are combined. Additional bedding for this villa includes a queen size sofa sleeper in the living room and also two bunk beds in the hallway between the bedroom and living room which are ideal for small children. There is a balcony located off the living room which offers a nice oceanside view. You’ll find Seaside Villa is located on the south end of the island, along South Forest Beach Drive, a short distance from Coligny Plaza. Seaside is an oceanfront property that is situated about 70 yards from the ocean. The amenities would include an on-site pool and complimentary access to the Player's Club for use of their indoor heated pool as well as their fitness center. Rooms Sleeps 6, 1 Bedroom, 1 Bath, Oceanside Seaside Villa, beach condo, kitchen, pool and health club. We had a pleasant stay. The only drawback was the heater in the bedroom. When turned on, the fan clanged against the house and made a loud, continuous noise. We could not use it. We have been staying at Seaside Villas since I was a child. Now I bring my children to stay. Overall we loved it. Poolside is great with the children being that there is no public restroom to use. Pool and pool area was clean and in order. Condo was great. Kitchen tools were broken and need replaced. 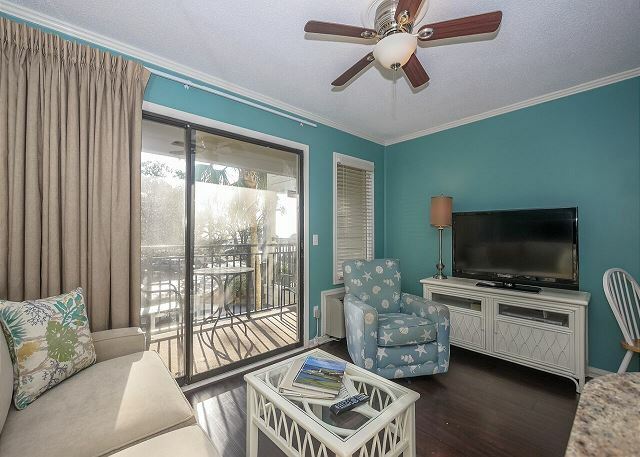 Short walk to the beach and short walk to Coligny Plaza. Will definitely stay again. Wonderful break from the real world! My wife and I used the villa as an escape from the chilly Ohio weather and we were not disappointed. We were able to ride bikes and walk the beach with the sunny and mild temperatures -- we couldn't have asked for better! This was our third time staying here an we will certainly be staying again. We did notice a significant difference in this unit for Labor Day weekend and the other two units we had stayed in. This particular unit is in need of some serious updating and additional supplies/amenities. The ceiling fan was so off balance in the master bedroom that we couldn't use it. The cooking supplies were limited and in need of replacement. However, we were at the beach and only a short walk from it. We love the company. They manage effectively and are so efficient and friendly. 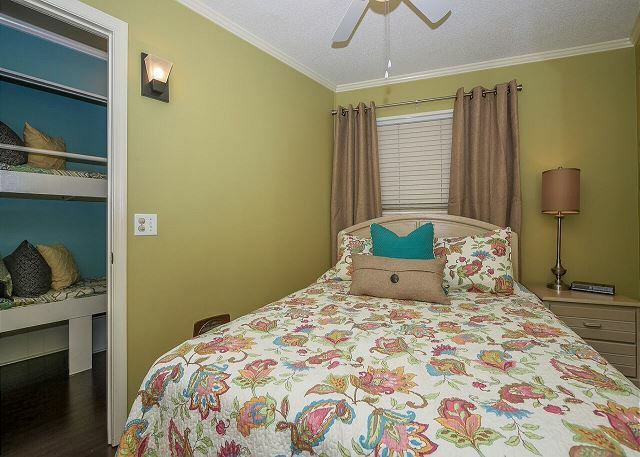 If you want to be close to the beach and get a reasonable price - use Vacation Time! We always stay in this unit and have a wonderful time. Awesome. Sunny blue skies, hot sand, lol. Seaside #152 was very close to the beach, poolside, and near all of the activities of Coligny. The villa was small but perfect for my husband and I. The room was not up to my standards as far as cleanliness. The villa was stocked with everything needed and more. The bedroom was very small and stayed hot. For a short stay for two we had everything we needed. One side of villa overlooked the pool. The other side of the villa had a view of the beach. This room was great and the office staff were very friendly and helpful! Would definitely go back again! We had a great weekend at Hilton head. The condo was very nice and so convenient to the beach. The overall stay was great. The building is right in the beach, just a short walk from the room. The building is a bit dated but the room was up to date and decorated nicely. The room is small, but perfect size for two. The bedroom was a bit smaller than I had hoped for, there is hardly any room in either side of the bed. The bed was comfy however and so was the couch. Just a few issues we faced. There were some stains on the living room furniture that were kind of displeasing. Mostly on the arm of the sofa and the chair. The biggest issue we had were ants. There were several ants in the kitchen after our trash can. Thus was obviously a known problem because we did find any spray in the cabinet. Hopefully with extermination this may be able to be resolved. The place was fine, but the TV drove me mad - couldn't get the remote to work, and the only channels I wanted to watch were at opposite ends of the spectrum. The dishes were varied, with only two mismatched cereal bowls; could have used more. I didn't dare open the balcony door after reading all the warnings! The rental unit was very nice, clean, and well furnished. It is small but is all you need for 2 people. Would like to have a better view of the ocean but we were only there for a couple days so it didn't matter. The pool was nice, very clean. Very small space, but you should know that getting into it as the site is very clear. It was exactly what we were looking for. Quaint, comfy, clean and the location was awesome! It was close enough to Coligny to walk, but far enough to enjoy a nice walk. The living room and kitchen areas were comfortable and accommodating. The bedroom a little small, but it was total darkness and, although it would get a little warm, the bed was comfy and room was dark so sleeping in was easy! Best location possible. Quite a bit smaller than expected. Doable for a short stay with a family of 4 but would be hesitant for a week stay. Very quiet. Great value for what it is. Have to walk far to the beach. Great place for 2/3 adults or 2 adults & small children. Bedroom small but good place for a few nights get away. the elevator didnt work most of the week and there were roaches in the room. Also the pest guy came and sprayed while we were in the room.. there was also mold and mildew on the ceiling, which was gross. The property is pretty small, but WAY better than a hotel. Great location. Professional group to work with. My family and I had a wonderful time. The landscaping is beautiful, it's next to the beach and the newly updated condo was awesome. We are looking forward to our next visit, hopefully this fall. The owners have done a great job with there unit. Come almost every year over Memorial Day weekend.Enjoy the location and easy beach access to be overlooking the pool Have stayed in more updated units than this one,but I have to be near the elevator due to disability. Vacation Time was professional and courteous, I would certainly rent through them again. Pros: Close, easy walk to beach. There's a beach access that runs right through the property. Updated, cheery decor. 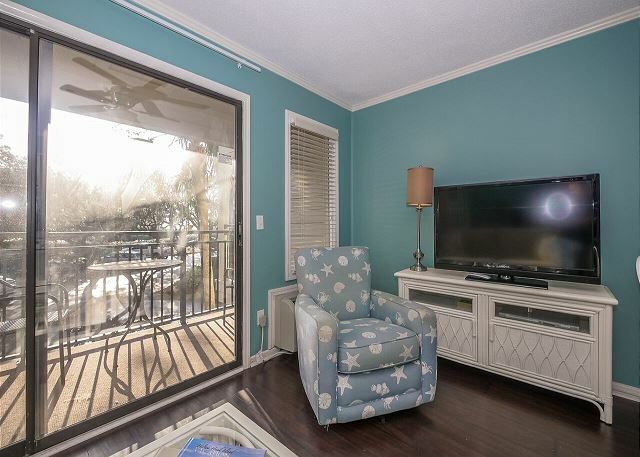 Large, flat screen tv in main area. Cons: While you can see a small glimpse of the water, you get mainly a parking lot view. Balconies are semi-private. While the property had been updated, the two towel bars were about to fall off the wall. I also noticed that several light bulbs needed to be replaced. Should't the cleaning crew notice that? No TV in the bedroom. The bedroom is small. The way that the bed is placed, one person has to crawl over the other to get out of the bed unless you can maneuver yourself in the six inch space between the wall and bed. It was nice, I just wasn't prepared for how compact the unit was. I don't think that more than two people would fit comfortably here. We stay at Seaside every visit to HHI. We needed an additional room and contacted Vacation Time of HH. We were very pleased with their services and also with the condo we rented. Will be renting this again next year. This unit was clean and in a very good location. The only fault was that there was no room to walk around the bed and in order to get to the other side you had to climb over the bed. I would stay at this location again, but perhaps would look for a different unit within the complex. The unit was a little smaller than what we anticipated. However, the location and condition of the unit was excellent. Perfect spot for a weekend get away. This property was perfect for our family of 5! Condo was clean & neat. Location was great. It was only a short walk to Caligny plaza (where everything is). I will definately be returning to this property! We are never disappointed when we stay at SEASIDE VILLAS. For us the location and price and the units that we have stayed in, all add up to an excellent vacation each and every time for the past several years. we really enjoy stay the next time we visit we will need to bed room. i felt little tight. other than that visit was great! Have stayed with SeaSide Villa before and we are always please with the accomodations. Our only issue was the queen bed in bedroom needs to be up under window or rearranged. Too close to wall, couldn't get out without crawling over partner. It really wasn't that bad but could be for elderly. Need ladder for the bunk bed. Saw couple of roaches dead. We apologize, but roaches are part of living in a tropical like climate. I have lived here for 35 years and won't ever get used to them. However, all our accomodations are sprayed on a monthly basis and it appears it was working thank goodness.